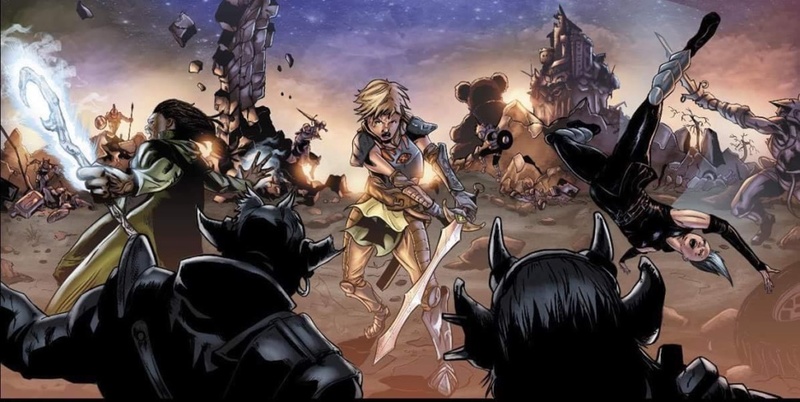 Vessels - A fantasy story from Card Shark Comics - 5D. The Card Shark & the blogger. Well the 3rd year of Granite City Comic Con here in the north east of Scotland just a couple of weeks ago was once again a suitably splendid affair with swath upon swath of lovely pop-culture geekiness. The crowds were plentiful, the Cosplay was breathtaking and the vendor tables simply a wall to wall treasure trove of mouth watering loveliness that meant that they very quickly drained the finances of this here blogger. Yes, even though 5D was attending the event in it’s official capacity of, ahem, press pass holder, it also meant that I could combine my official role of meeting and greeting prospective collaborators with buying lots and lots of stuff for myself……..and boy did I buy lots of stuff. The man in question it turned out goes by the name of Dave Cook who foundered the aforementioned Card Shark Comics, an Independent comic publisher based in Scotland, home to critically-acclaimed apocalyptic series Bust, dark fantasy saga Vessels, journalistic conspiracy The Faceless and other titles. So, just what is the Vessels story I hear you ask?……. let me enlighten you. “Inspired by the Dark Souls videogame series, and mashing up RPG styles with the trippyness of Doctor Strange, Vessels is a dark fantasy saga that chronicles the final days of a dying world on the verge of collapse. The realm of dreams – the Veil – has crashed head-first into the waking world, causing the laws of reality and reason to implode. Nothing is how it should be, and modern day objects and technologies are raining down on the land. Our hero – a legendary warrior named Wake – and her companions, the mage G’Dala and theif Marillon must travel the land to halt the decay of reality itself, and unravel the mystery of the Vessels – five bloodthirsty knights hell-bent on stopping Wake from completing her goal. Vessels quite simply is a joy. Dave Cook’s writing is of such a quality that from the onset the reader is transported with consummate ease into a disintergrating and forsaken world where only last few vistages of hope exist. The dialogue is consistently crisp and engaging whilst the narrative effortlessly carries the reader along with the rest of the thoroughly fleshed-out characters which includes a heroine who for once is sympathetically portrayed. All too often the temptation seems to be to seemingly purposely create a dislikable protagonist, but not this time. The narrative throughout is fluid and sparkling. Of course, for any comic book to succeed it cannot rely solely on the writing if the artwork lacks in quality. Thankfully it doesn’t need to because Vessels is genuinely beautiful to look at. Not only are the characters lovingly featured but the colours and textures provide a layer upon layer of richness and depth that serve to make this decaying and tortured land as dark and authentic as possible. This is a fantastical yet at times abhorrent world filled with equally fantastical and abhorrent characters, all of which is skilfully brought to life by the delightful artwork. Messrs, Desquitado Jr, Lehman and Gunn deserve all the plaudits that will head their way. It doesn’t take much of an expert to realise that I would highly recommend Vessels. If you like a fantasy comic with a strong emotional narrative and all wrapped up in enthralling textured artwork, then this is the one for you. 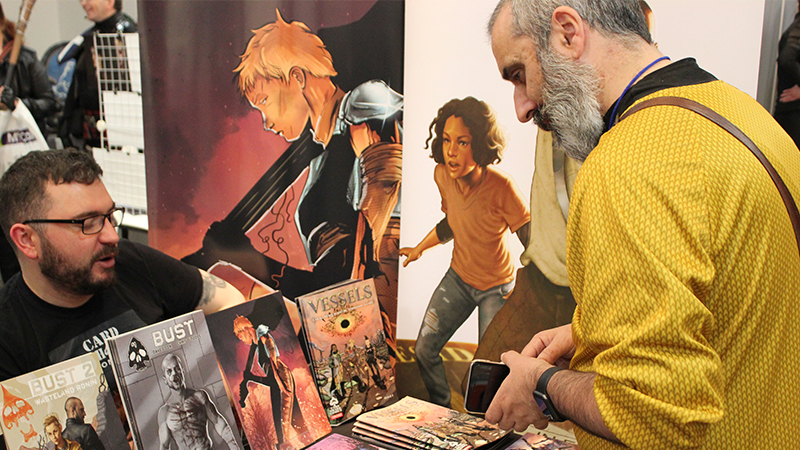 As I mentioned earlier Dave originally enticed my interest by suggesting that I may want to have a sneak super secret peak of the first few pages of issue 2 of Vessels, which will not be released until July. As my regular reader will testify (as long as the drugs work) I dislike intensely anything in the realm of spoilers, so all I will say for now is that the story begins with another seismic narrative event and contains the same delicious level of artwork. I for one cannot wait until I get my eager little hands on the next edition.